Gone are the days when people would only have traditional Vietnamese foods as Tet (Lunar New Year) treats. Many families now prefer treating themselves and guests to foreign-made delicacies, which are not hard to buy in Ho Chi Minh City, during the most-anticipated holiday in the Southeast Asian country. Specialties imported from around the world, from the U.S. and the UK to Japan and South Korea, are widely available in the southern metropolis and selling well as Vietnamese now have less than a week left to prepare for Tet, which begins on February 2. As per tradition, Vietnamese will have traditional jams and candied fruits, banh chung or banh tet (glutinous rice cakes) and some traditional dishes made from pork and chicken for Tet celebrations. Another reason why foreign dishes will dominate the Tet dining table of many Vietnamese families this year is that locals now have bigger budgets for the holiday shopping spree, according to Ta Tien Thang, manager of US.Mart, a supermarket specializing in selling American goods. 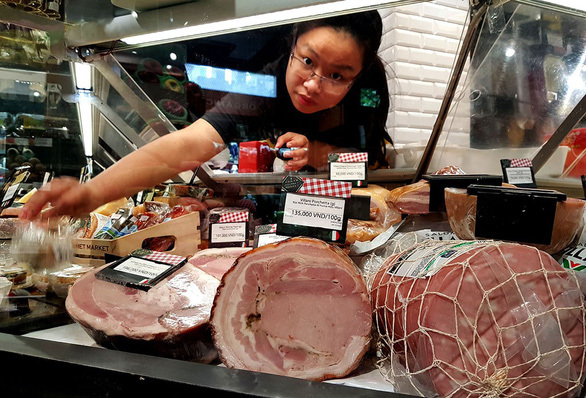 Demand for foreign dishes is so strong that a supermarket specializing in Russian foods in District 1 has nearly run out of its signature products such as Astrakhan dried fish, salami, red caviar, black caviar and vodka, a representative told Tuoi Tre (Youth) newspaper. Goose thighs and wings, despite being imported in large quantities, sold out while several kinds of confectionery, chocolate, and Russian wine and beer will soon be out of stock, he added. The supermarket representative explained that Russian foods are favored by Vietnamese people as they are easy to cook and their taste happens to match the common drinks during Tet parties. Also in District 1, the US.Mart is enjoying good sales of its American cookies, chocolates, marmalade, passion fruit jam, and canned juice, whereas the Japanese supermarket Akurihi says sales of its rice cakes, snacks, sake, matcha tea and fresh seafood have been double the normal figures. Likewise, the sections selling South Korean confectionery, beverages, wine, tea, spices and noodles at the Emart supermarket in Go Vap District were on the weekend crowded with customers who wanted to add ‘new tastes’ to their Tet. Other prominent retailers such as Thailand’s Big C and MM Mega Market, and Annam Gourmet Market have also cashed in on the market of imported delicacies for Tet by putting more foreign confectionery and jam products on their shelves. MM Mega Market, formerly known as Metro Cash & Carry Vietnam, anticipated that the demand for imported goods during the Tet holiday will increase by 20 percent, according to a representative. The Thai retailer has thus stockpiled a variety of products from many countries such as South Korea, Japan, Thailand, America, Canada, New Zealand, and Egypt at its supermarket locations. South Korean fruits are particularly favored by Vietnamese consumers as the products that have eye-catching appearance and high quality are available at reasonable prices, the MM Mega Market representative said. Vietnam’s love for South Korean foods also helped K-Market double its sales of packed and frozen seaweed, kimchi, instant noodles and fruit juice imported from the East Asian country, according to store manager Jang Nam Suk. Jang added that many people from the neighbors of Ho Chi Minh City even came to stores under the K-Market chain to shop for Tet foods.